"Captain Millie, please don't ever consider getting a spaceship license." Most anime series seem to start off strong with the introduction of characters and the set-up; then they downshift into episodic, "filler" episodes, where nothing much happens save character development. Then, once we've begun to understand the dynamics of the series, the main story arc kicks in, building up to a no-doubt explosive finale. 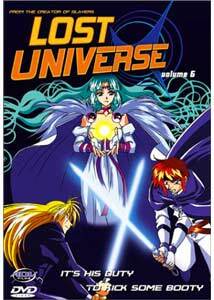 Unfortunately, I am reviewing volume 6 of Lost Universe, which means I missed out on both the set-up and the filler. Based on the strength of these five episodes, however, I'd say that the series is definitely of interest. Lost Universe was directed by Takashi Watanabe, creator of Slayers, and from what I can tell, both work in much the same way. I did some reading on various anime sites and discovered that the earlier episodes played largely as comedy/adventure, much like Slayers did. However, in their final five episodes, the show becomes a bit dark and serious. Kain is the pilot of Volfield, a vessel known as a "Lost Ship." The Lost Ships were created by a long-vanished civilization, and they are immensely powerful. Kain's friends include the ship's virtual-reality interface, the adorable Canal; the pilot/gunner Millennium; and her ditzy sidekick Nina. The rather complicated plot boils down to this: a secret organization called Nightmare is trying to destroy Volfield with their own Lost Ship. They plan to instigate the rebirth of Dark Star (which I'm sure was covered earlier in the series, but here I was at a loss). There is a lot to like about this show. The animation is very good, with an innovative mix of hand-drawn characters and computer animated ships. The CG gives the battle scenes some visual kick. The character designs are ok, but seem pretty similar to Slayers to me. There is a nice blend of humor and action, even in these later episodes, but as I said, I expect the earlier stuff was more lightweight. Factor in a rather touching conclusion and this disc is well worth a look. But please, unless you have time to work out the plot with charts and graphs, start with an earlier volume! Image Transfer Review: The Lost Universe blend of animation and CG comes off pretty well on the DVD. Colors look vibrant or muted as necessary for the narrative. Contrast looks good, and black level is excellent. Overall, only a bit of aliasing mars this image. Audio Transfer Review: This mix is comparable to most other anime/TV tracks I have heard, which means, overall, the presentation is very good. Speech is always audible and natural. Sound effects (especially the various explosions) sound very full and suitably supported. Unfortunately, the front soundstage isn't very wide, which has an impact on the overall effect of the audio. Still, this certainly sounds good enough! And please, for the sake of all that is good, listen to the subtitled version. It features one of the biggest vocal anime stars (Megumi Hayashibara), and is top-notch. The dub is one of the worst I've heard. Extras Review: Nothing is available aside from the usual mix of front-end ADV trailers (see above). Still, I can't fault ADV too much, since there are five full episodes included. I admit it's a bit tough to judge a series solely on the finale, but I think it's safe to say Lost Universe is probably a good bet for anime fans. The five episodes on this disc make it one of the best anime values for the price. People used to pay $29.99 for two episodes on VHS!